Note: This is the first in a two part series by two University of North Carolina Masters of Public Health students describing their experience of spending their summer practicum working with Village Health Workers in Thailand. As we sat down on the floor of our host mother’s back porch and began to eat vegetables with a spicy fish dipping sauce, a sweet and savory curry with potatoes and chicken, fried fish, and stuffed cucumber soup, we realized that we had come a very far way to ask questions about something universal: how people provide support to their peers and what effects this support can have on their health. The day of our first site visit we found ourselves in BangNamPhung, a semi-urban town two hours outside of the capital of Bangkok, Thailand. We were two Master’s students in Health Behavior who had traveled to Thailand to research the Village Health Volunteers—lay health workers in Thailand. Specifically, we were interested in how characteristics of the community (strengths, identity, problems) influenced the functions and roles of the Village Health Volunteers. We hoped to understand which activities were universal among Village Health Volunteers and which activities were variable. We also wanted to understand how changes in the health status of Thailand and increased government involvement had impacted the Village Health Volunteer program. We hoped to develop this research as part of our summer practicum at the University of North Carolina at Chapel Hill, under the support of both Dr. Fisher, the director of Peers for Progress and Dr. Chanuantong, a faculty member at Mahidol University. Dr Chanuantong has had extensive experience with projects that have increased community capacity and the Village Health Volunteer system. Our research consisted of three site visits during which we conducted semi-structured interviews, shadowed the Village Health Volunteers during their home visits, sat in on trainings, and had many informal conversations over meals. 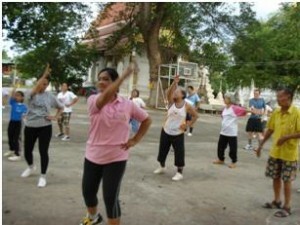 The semi-urban communities were in the central region of Thailand with their own unique strengths and health problems that the Village Health Volunteers were confronting. For example, in BangNamPung, the Village Health Volunteers convened and empowered an elderly support group that went for weekly walks and advocated for increased funding of programs at the local level for elderly people. In PhanatNikhom the Village Health Volunteers worked closely with Public Health Officials to design and implement an innovative campaign to control Dengue Fever, which was a major health problem in the community. In each community, we followed the same protocol. We talked with community leaders such as the head administrator or the head monk to and explain our interests. We then asked permission to live and work in the community. We also enlisted the expertise of these village leaders to identify key members to talk to and learn abou t the community. We then conducted interviews and observations with the Village Health Volunteers and community members to understand both the support that was provided by the Village Health Volunteers and the context in which it occurred Working in these Thai communities has been both educational and fun. In order to build rapport and relationships, we lived and fully engaged with the community by participating in a wide variety of activities. For example we engaged in dance aerobics with many elderly women and enjoyed conversations and wonderful meals such as the one that started our site visit in BangNamPung. Through our research, we will describe the strengths of the Village Health Volunteer systems as a program for peer support. We will also discuss how community health problems, collaboration with public health offices, and programmatic changes at the national level influence the functions and support of the Village Health Volunteers.